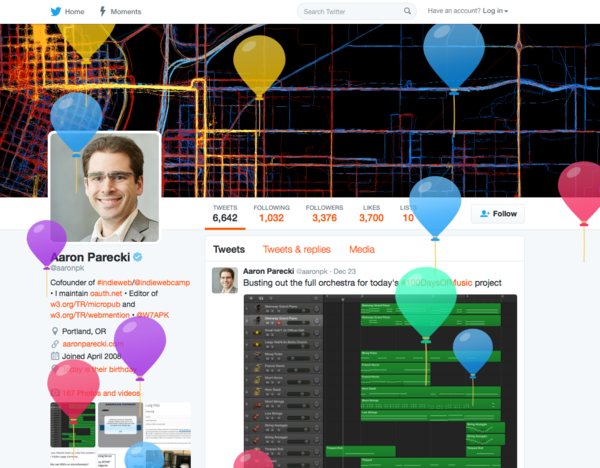 A birthday is the date when someone is born, however in the context of the indieweb, it is a feature displayed on some silos' user profiles that you can (or must) enter, and some prominently present to your friends on the month and day of your birthday, like Facebook's "BIRTHDAYS THIS WEEK" feature at the top of their events page. Sebastiaan Andeweg added some code to display a cake-emoji next to the profile picture on his main h-card, which also advertises his birthday in mf2, but only on the day itself. Martijn van der Ven displays his age and a countdown to his birthday on his website. The countdown, when parsed for microformats gives the time-of-birth as bday exact to the minute. Birthdays are often used as part of a person's identity and thus publishing a precise accurate birthday pose an identity theft security risk. As a result, people at some IndieWebCamps have self-reported as using non-real birthdays on silos.